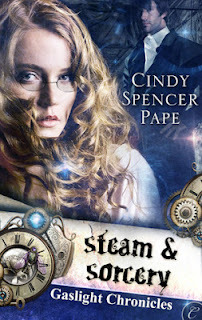 Sir Merrick Hadrian's life is turned upside-down by five talented orphans - and the governess he hires to care for them - in Cindy Spencer Pape's first Gaslight Chronicles story "Steam & Sorcery." It's hard to be a governess. Never mind the children; even when they're spoiled brats there's usually something to work with. No, Miss Caroline Bristol's problem has been with the master of the house. Specifically, when she (rather firmly) refuses their advances, she generally finds herself tossed out of the household. Thankfully Sir Hadrian, while certainly the most attractive of Miss Bristol's employers, seems completely oblivious to her. Perhaps that's because Merrick has his hands full. Besides the fact that he found this group of street urchins while breaking up a den of Vampyres, there's some magickal-ness to them as well. The oldest is obviously a Knight, and the girl has a way with mechanicals that seems almost magickal as well. Out of an obligation to children of Knights, whether acknowledged or not, he takes young Thomas in, and along comes the rest. But even the household of a lord isn't perfectly safe. In fact, in searching out the origins of the vampyres Merrick encountered, he and Caroline must seek out London's seedy underbelly. And with Jamie's visions warning them that death is in their future, it will take all of their talents combined to come out whole. Cindy Spencer Pape creates a world rich with European traditions interwoven with a London that never was. Steampunk elements are little more than window dressing in this story, but even as such, they add to the rich descriptions of the era and the talents of the characters. Steam & Sorcery is one of the better 'Steampunk Romance' novels out there, written by someone who understands that the fantasy element and characters are at least as important as the more...steamy scenes.